Wild privet or ligustrum vulgare, also known as the common privet, is the only privet native to the UK. As a result, it will feel right at home in most British gardens and has been a true British hedging classic for many years. Due to its rapid growth, its resistance to pollution and its dense, dark green foliage, wild privet has been a very common hedging plant among city gardens in the Victorian era. This robust, undemanding hedging plant will thrive in just about well-drained soil, including a number of soils that are generally considered difficult. 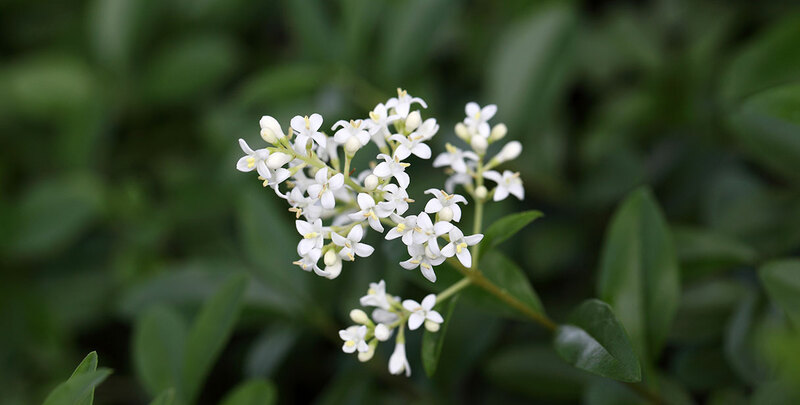 In addition to providing year-round screening, wild privet hedges will produce small white flowers during the summer months and black berries in the autumn. The flowers have an unpleasant smell and are usually sacrificed during pruning, but they do attract wildlife. A wild privet hedge is neither evergreen nor completely deciduous. Its foliage will dry out during the autumn months, but will usually stay on the plant until it is replaced by new leaves in the spring. Wild privet is generally categorised as a deciduous plant due to the fact that it will shed its leaves when winters are exceptionally harsh. These winters are quite rare in the UK, however, and even when one occurs, you do not have to worry, as new leaves will grow on your wild privet hedge as soon as springtime comes around. This semi-evergreen hedging plant is therefore one of the very few deciduous plants that you can plant in your garden if year-round screening is what you are after. Since wild privet is a strong, versatile hedging plant, it will easily adapt to many difficult circumstances. Gardeners commonly consider polluted, heavy, poor or chalky soils to be difficult soil types, but as long as you plant your wild privet hedge in a well-drained soil, it will thrive. However, like most hedging plants, it does not cope well with waterlogging. Deep shade is also best avoided, but a wild privet hedge will be able to cope with just about any other position, including exposed and coastal sites. A wild privet hedge will reach an ultimate height of about 4 metres at an average annual growth rate of approximately 30 centimetres. This relatively fast growth rate requires this type of hedge to be pruned twice a year, preferably during the summer. Wild privet is very tolerant of pruning and will even recover after being trimmed rigorously. For a tough, undemanding and reliable hedging plant, look no further than the wild privet. Its growth rate allows the plant to reach its desired height relatively quickly and despite the fact that it is not an evergreen, it will provide screening even during the cold season. It will even be able to cope with the difficult circumstances unique to urban areas.